1.Before beginning work, vendors go through a low-barrier application, interview, and training process. 2. Vendors are not required to have an ID to apply and do not need to have a background check. 3. Vendors sign a code of conduct outlining their vending procedures and rules. 4. 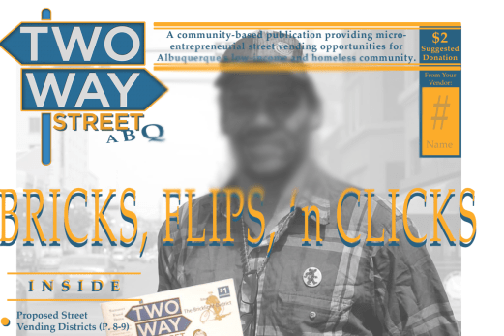 Vendors purchase each copy of the paper for 25 cents and ask for $1+ in donations. 5. Vendors are self-employed – the operation holds the business license and pays taxes. 6. Under the First Amendment, vendors are not required to purchase the City’s solicitation permit. Help Us Grow. Make An Impact. If you are interested in learning more about Two Way Street or would like to volunteer in the future, please email us at [email protected], or use the form below.